Start reimagining customer service, and your business. Try Service Cloud free for 30 days and see how to deliver faster, smarter, more personalized service anywhere your customers are. Learn how to give your agents instant access to the information they need to answer every customer's question in a flash. 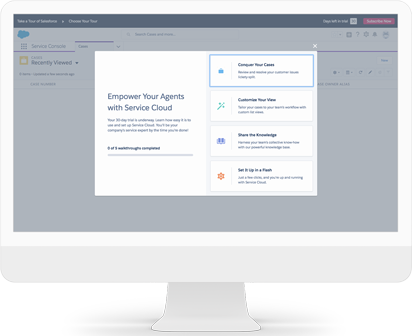 With built-in best practices and easy setup, you'll see why Service Cloud is the world's #1 customer service platform.